This greeting card tutorial features a design element that is also a gift. 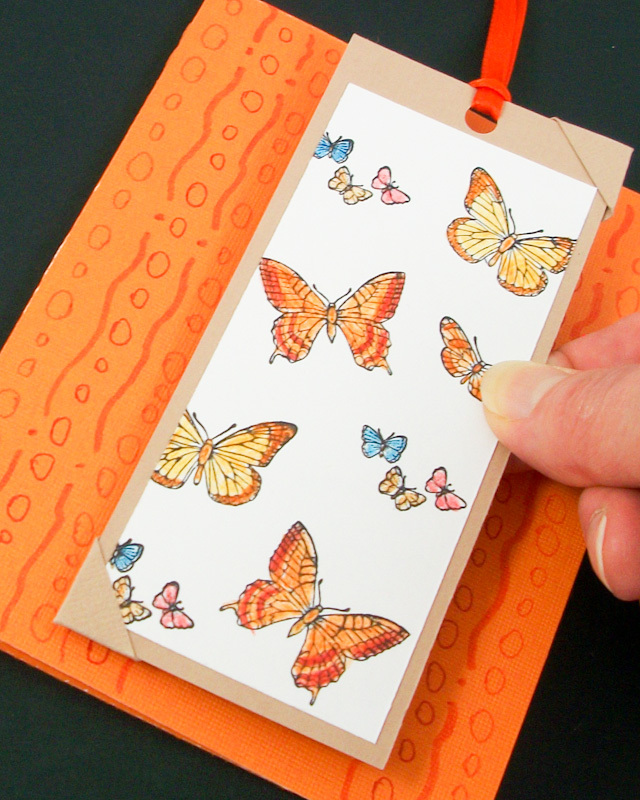 You'll see how to create a beautiful and functional bookmark that is the focal point for the card, and learn a simple decorative technique using markers. This tutorial also introduces colored card blanks and tips for using them successfully in your card making. This greeting card tutorial builds on the previous tutorials, especially #1: Four Patch Cards and #2: Matted Clip-art and Photo Cards. If you are new to card making, review these tutorials before starting this one. 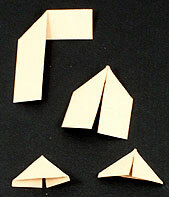 Refer to Tutorial #1: Four Patch Cards for how to make card blanks and envelopes. 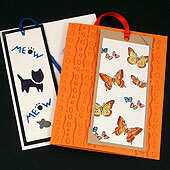 This tutorial is 8th of twelve card making tutorials and is rated AVERAGE to do. 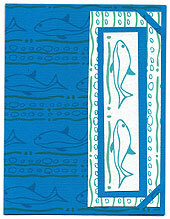 Select colored cardstock for your card blank and a coordinating color of cardstock for the bookmark. For this card, choose a medium-tone cardstock for the card blank and a coordinating colored marker that can be seen when drawn on the cardstock. 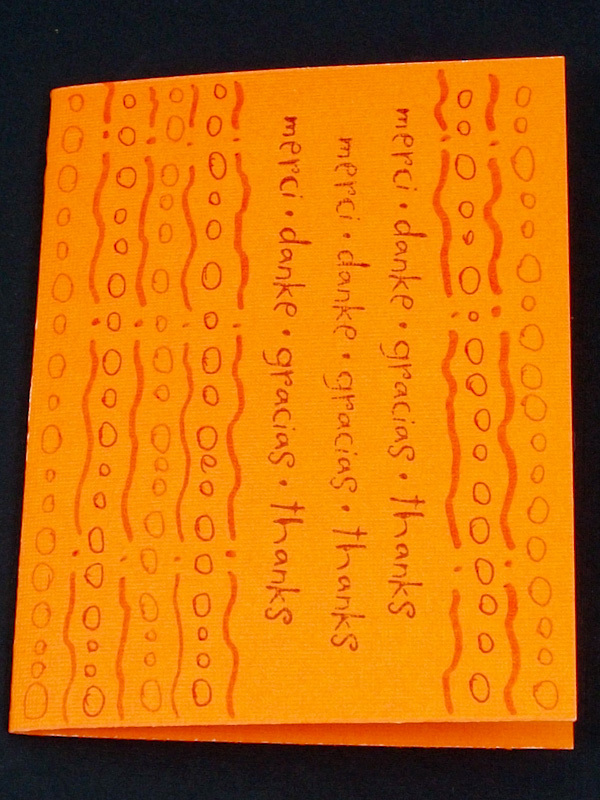 Two warm colors, orange and light brown, are used in the sample card. For more color combination ideas, refer to the color wheel concepts in the Paper Weaving Card Tutorial. 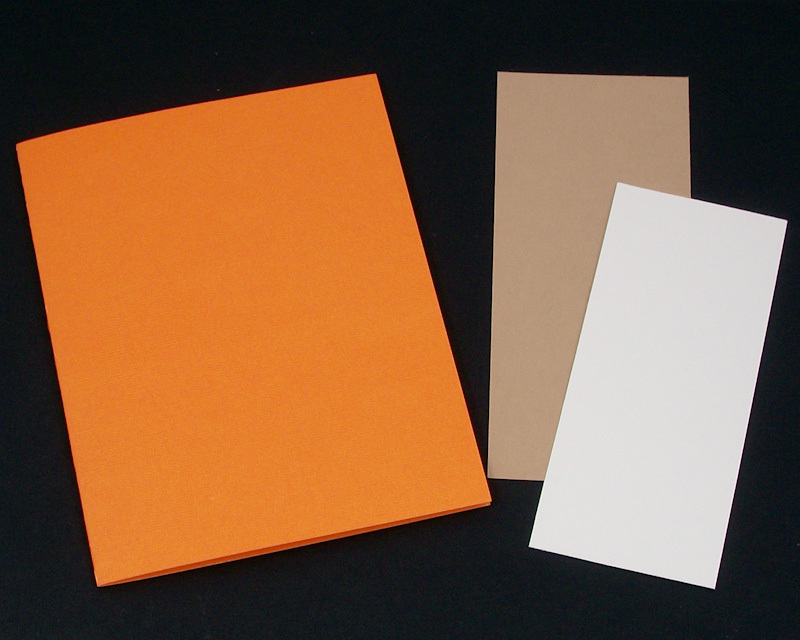 Tips: When using colored card blanks, it is important to use contrasting colors. The easiest way to do this is to use white cardstock as a major element of the card. Dark-colored card blanks require special consideration, since standard markers and rubber stamps aren't very visible on a dark background; however, gel pens and metallic markers can be used to good effect. 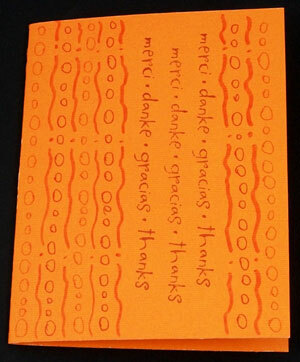 For messages inside a dark card, use a liner of white paper. 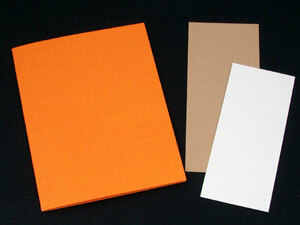 For the card blank, cut a full sheet of letter-size cardstock in half to make two 8½" by 5½" card blanks. 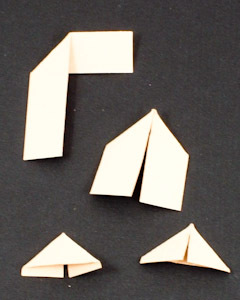 Fold the card blank in half to make a 4¼" by 5½" card. 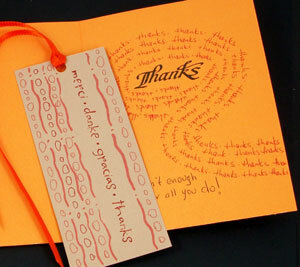 For the bookmark, cut a 2¼" by 5" strip from colored cardstock and a 2" by 4½" strip from white cardstock. For attaching the bookmark to the card two photo corners are needed. Cut two ½" by 2" strips of colored cardstock to make your own color-coordinated photo corners. 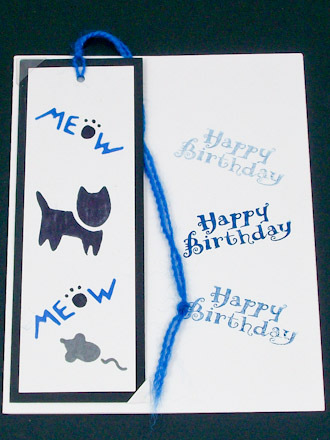 Since the bookmark is the major design element on the card, make it first. 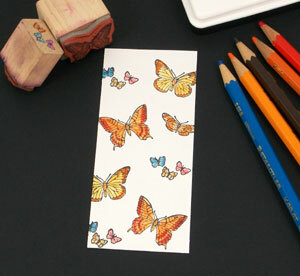 Using rubber stamps, stamp images on the white cardstock. Let some of the stamped images run off the edge of the cardstock. 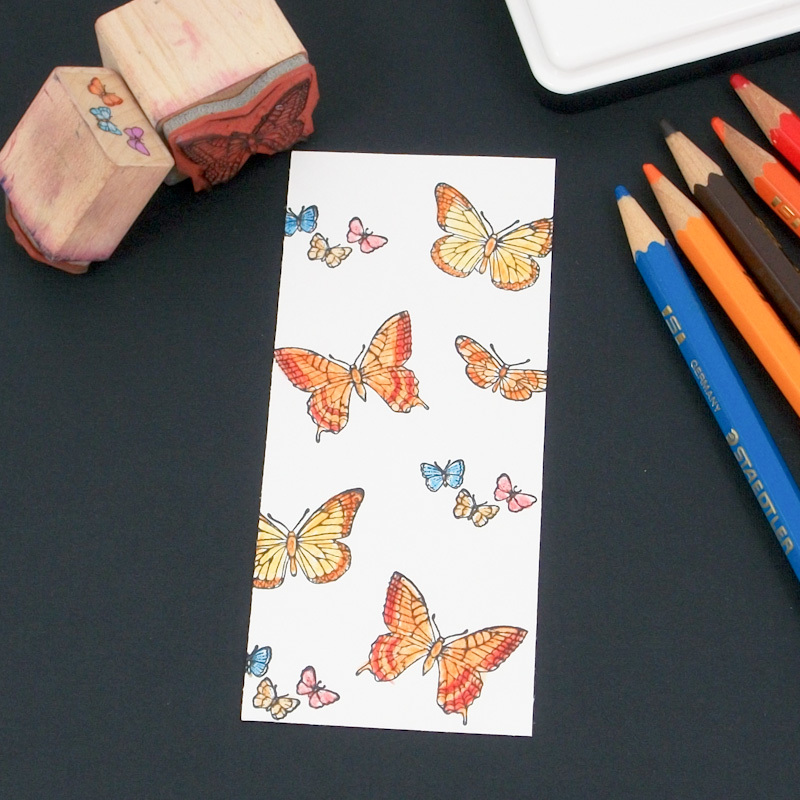 Color the stamped images using markers or colored pencils. Be sure that the colors coordinate with the cardstock colors. In the sample card, a splash of blue, orange's complementary color, is used to liven up the card. Glue the white cardstock strip to the colored cardstock strip. Punch a hole at the top for the ribbon. Cut a 12" to 15" length of ribbon and fold in half. Poke the fold through the punched hole, front to back, and thread the tail through the loop—then pull tight. Decide where to place the bookmark on the card front—to the left, the right or in the center. 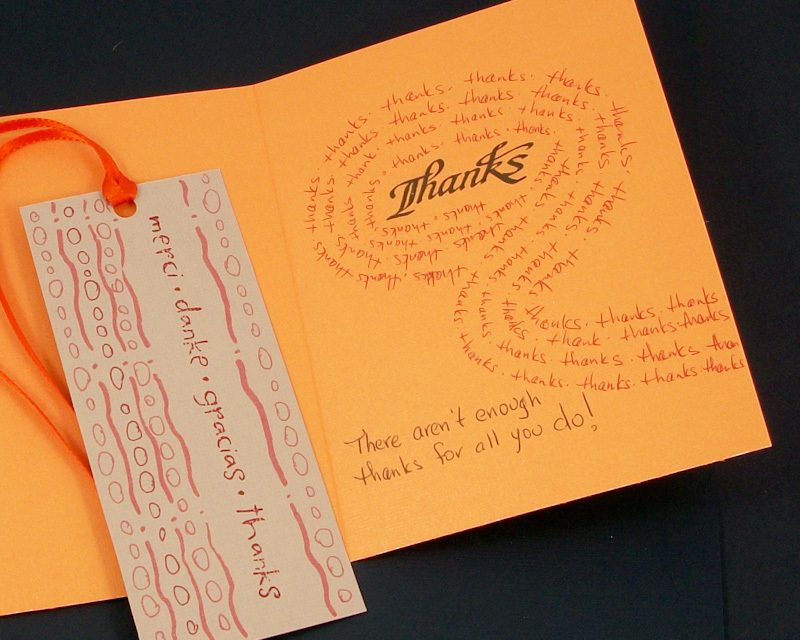 Using the marker, draw simple decorations on the card front. 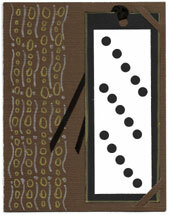 For the sample card, squiggled lines with dots were drawn from the left side and the right side using the brush tip of the marker. The spaces between the lines were filled with small and large circles drawn with a fine point. A darker marker was used to draw every other row of circles. A message was stamped in the blank space where the bookmark will be attached. Two photo corners are used to mount the bookmark on the card front. Slip one photo corner on the upper right corner of the bookmark and another on the opposite corner. With the two photo corners on the bookmark, press the bookmark and photo corners in place on the card front. Tip: To make photo corners, fold both sides of the ½" by 2" strip on 45° angles to form a corner. Trim the tails. Apply glue or double-sided tape to the back of the corners. 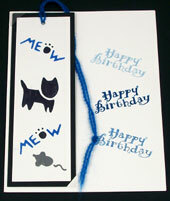 Use them to attach the bookmark to the card as described above. Decorate the reverse side of the bookmark with markers and rubber stamps, punches, stencils, or decorative paper. Add a message to the inside of the card using black and colored markers, or insert a printed verse matted in a coordinating color of cardstock. That's it! Your card is done! Think about what you plan to make. Imagine how you can add your own creative touch. Gather the materials you will need. Get ready, and get started!!! 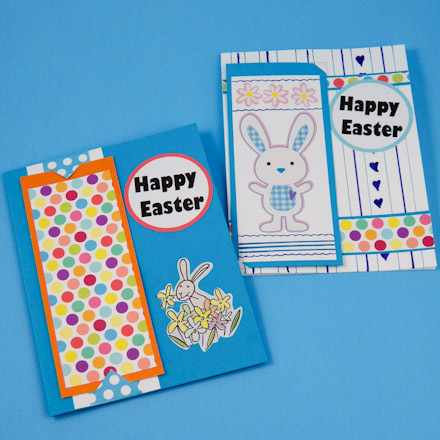 Tip: Use Aunt Annie's set of Easter Dots ePapers to make Bookmark Cards for Easter or to make other handmade greeting cards. These ePapers coordinate with the Pastel Polka Dot ePapers. 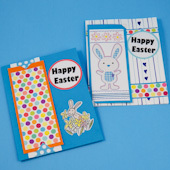 To make bookmark cards for Easter, use Easter Dots ePaper and add Easter stickers or clip art. You might use the Easter stickers in the Easter Egg Holders craft project. 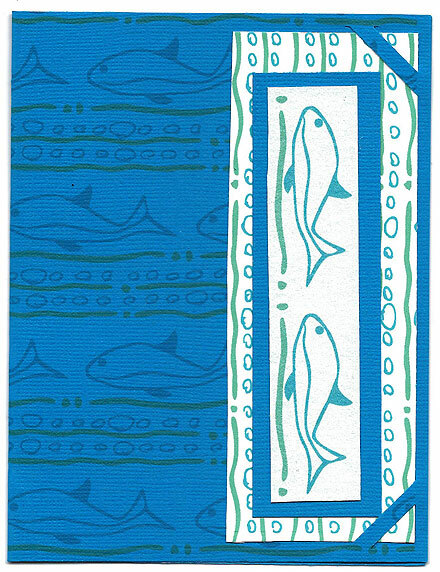 Tip: Use Aunt Annie's coordinating Fishy Squiggles ePapers or Squiggly Fish ePapers to make bookmark greeting cards or other card. 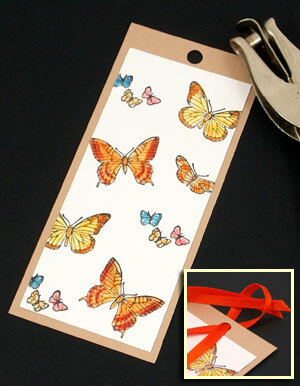 Tip: Stenciling is a quick way to make bookmarks. 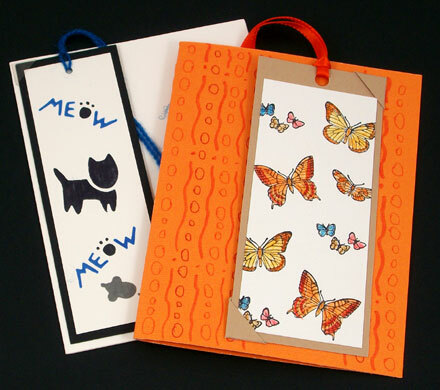 Tip: Metallic felt-tip pens and gel pens can be used to decorate dark colored cardstock. 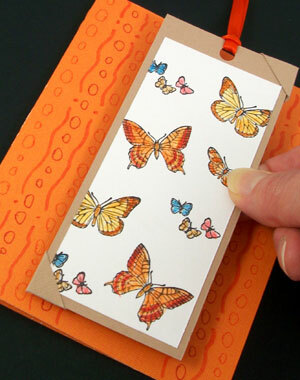 Related craft: This card is embellished with a simple Punched Bookmark.